Porky Pig by Steiff. A beautiful limited edition Steiff item, made by hand in pale pink mohair. LOONEY TUNES and all related characters and elements © & ™ Warner Bros. Entertainment Inc. (s19) He’s cute and patient, until he gets mad. He’s also naïve, innocent, and smarter than you’d think when he partners with Daffy Duck. 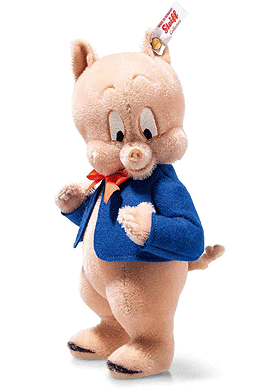 Porky was the first real star at Warner Bros.’ cartoon studio. His sweet and shy and never-say-die nature won over audiences every time. And what would a Looney Tunes cartoon be without his “Th-th-th-that’s all, Folks!” at the end? Now that’s star quality!